Kyle Grillot - kgrillot@shawmedia.com Woodstock sophomore Brecken Overly (22) and senior Andrea Wright can't get control of the ball during the first game of the regional semifinal match between Johnsburg and Woodstock. 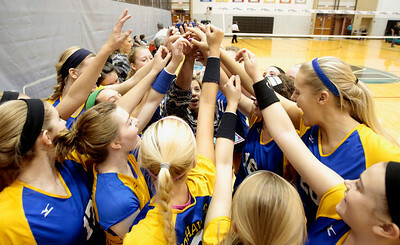 Johnsburg won the match in two games. 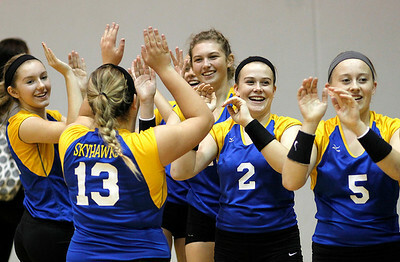 Kyle Grillot - kgrillot@shawmedia.com Johnsburg senior Emily Whitlock (13) celebrates with her teammates after a scored point during the second game of the regional semifinal match between Johnsburg and Woodstock. 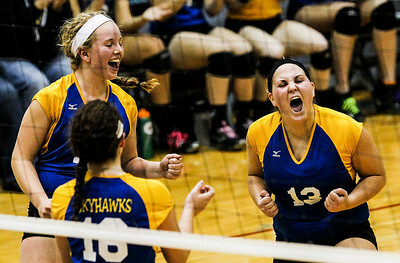 Johnsburg won the match in two games. Kyle Grillot - kgrillot@shawmedia.com Woodstock freshman Georgia Wicker watches as Johnsburg scores a point during the first game of the regional semifinal match between Johnsburg and Woodstock. 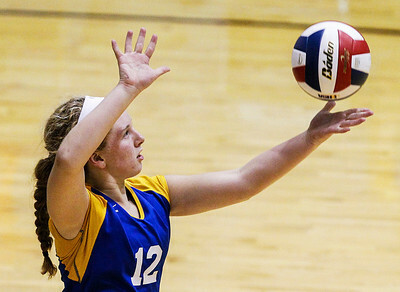 Johnsburg won the match in two games. Kyle Grillot - kgrillot@shawmedia.com The Johnsburg team comes together around coach Sue Feely (center) for a cheer before the start of the second game of the regional semifinal match against Woodstock. 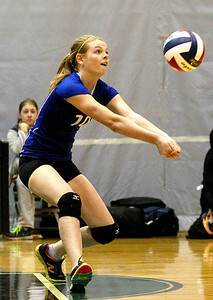 Kyle Grillot - kgrillot@shawmedia.com Johnsburg sophomore Abby Majercik serves the ball during the first game of the regional semifinal match between Johnsburg and Woodstock. 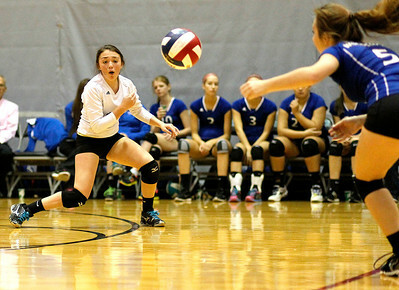 Johnsburg won the match in two games. Kyle Grillot - kgrillot@shawmedia.com Woodstock junior Selena Juarez (right) watches as her ball is blocked by Johnsburg senior Amanda Cherwin (left) during the second game of the regional semifinal match between Johnsburg and Woodstock. 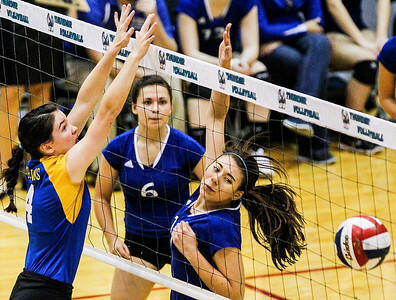 Johnsburg won the match in two games. Kyle Grillot - kgrillot@shawmedia.com Johnsburg senior Amy Majercik spikes the ball past the Woodstock defense during the second game of the regional semifinal match between Johnsburg and Woodstock. 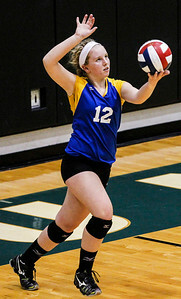 Johnsburg won the match in two games. Kyle Grillot - kgrillot@shawmedia.com The Johnsburg team celebrates after beating Woodstock in the regional semifinal match. Kyle Grillot - kgrillot@shawmedia.com A Woodstock player whose number is not on the roster bumps the ball during the second game of the regional semifinal match between Johnsburg and Woodstock. 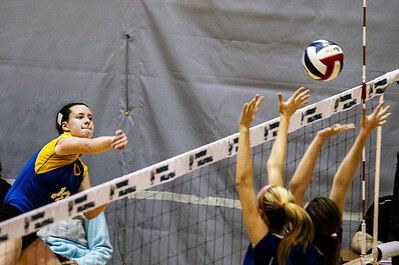 Johnsburg won the match in two games. Johnsburg senior Amy Majercik spikes the ball past the Woodstock defense during the second game of the regional semifinal match between Johnsburg and Woodstock. 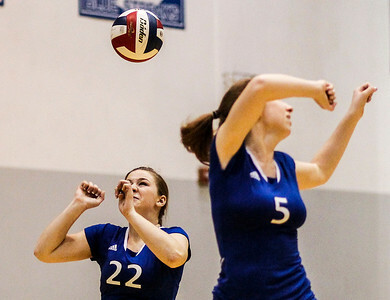 Johnsburg won the match in two games.